By the end of 2015, nearly 100% of our children’s (0–12 years old) products met the NF criteria for children. Gerber achieved this milestone for 100% of its infant, toddler and preschooler products in 2014. In addition to this milestone, Gerber invested more than $100 million in technology and worked with more than 80 experts for more than 120,000 development hours to announce our breakthrough innovation in 2015 with GERBER 3RD FOODS® Lil’ Bits™ recipes, a new line of baby foods with soft pieces of fruits or vegetables that help babies master essential chewing skills while providing essential nutrition. Childhood obesity, ranking high on the list of issues material to our stakeholders in the United States, is an issue we have joined with many partners to address and are committed to being part of the solution. Nestlé is a founding member of the Healthy Weight Commitment Foundation (HWCF), a CEO-led coalition of more than 300 organizations helping families and schools fight childhood obesity since 2009. In 2015, Nestlé contributed program data to the HWCF’s Commitment to Healthy Communities program, an academic research partnership with City University of New York that seeks to assess the impact of community programs sponsored by food and beverage companies designed to combat hunger and obesity. We are also part of the Roundtable on Obesity Solutions. Established in 2014 by the Health and Medicine Division (formerly the Institute of Medicine), the Roundtable on Obesity Solutions engages leadership from multiple sectors, including Nestlé, to help solve the obesity crisis. Our partnership with the Boys and Girls Clubs of America, also highlighted in this report, promotes physical activity and tangible fitness goals among youth, a key area where we can make a difference. Additionally, as a founding sponsor, Nestlé partnered with the American Academy of Pediatrics to launch its new division, The Institute for Healthy Childhood Weight (IHCW), to focus on translating policies, best practices and emerging scientific evidence into practical solutions for health care providers, communities and individual families. Established in 2012, the IHCW has provided education and practical tools to pediatric healthcare professionals and consumers. 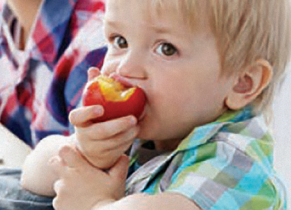 GERBER® developed its Start Healthy, Stay Healthy™ stage-based nutrition system of food and beverage educational materials and easy-to-use tools. This system, which is based on the latest peer-reviewed nutrition science, is designed to help guide healthy growth and development of children from ages 0–4 years old. It also helps promote the early establishment of healthy eating habits in the critical early years. Breastfeeding is at the heart of the Start Healthy, Stay Healthy™ Nutrition System, and Gerber recommends breastfeeding as the ideal nutrition for babies. To learn more about these resources, visit www.gerber.com. The Start Healthy, Stay Healthy™ Early Childhood Nutrition program continues to tackle childhood obesity rates in local communities by teaching parents and caregivers of children 0–3 years old simple ways of improving the diets of infants, toddlers and preschoolers. We’re partnering with academic institutions and community organizations to deliver an unbranded, peer-reviewed curriculum and training for local residents who then act as advocates and peer educators in their communities. This program covers topics including the importance of breastfeeding, how to increase fruit and vegetable consumption, healthy snacking, dealing with fussy eaters and recognizing hunger and fullness cues. In 2015, we continued to build on our previous obesity prevention work started in 2014 in Newark, New Jersey, with Rutgers University-Newark and Program for Parents, Inc., and trained 57 people. Similarly, we continued work started in the Woodland neighborhood of Birmingham, Alabama, with the University of Alabama at Birmingham School of Health Professions and Woodlawn Foundation and trained more than 200 parents, caregivers and students about preventing obesity through early childhood nutrition.